How the letter "D" sent the Outfoxed gals into a paroxysm of spin and deceit. With J$P Video: the video they don't want you to see. This is an unnecessary post. It didn't have to happen. We tried, we cajoled, we urged, we pleaded for them to tell the truth. But they refused. So it is that again we have to expose another example of dishonesty, hubris, and fraud from the newshounds (another fine product of the Outfoxed syndicate). Fox still can't get it right. 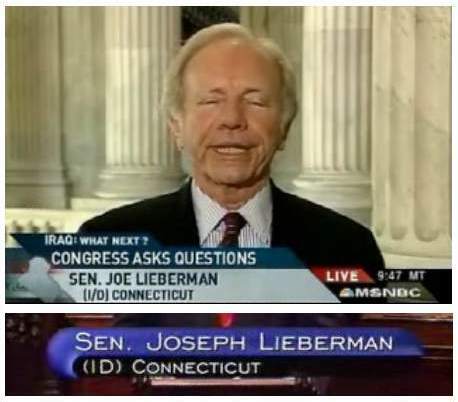 Lieberman appeared on Your World w/Neil Cavuto this afternoon and he was identified correctly -- as an independent from Connecticut "(I-CT)" -- until the very end, when the chyron read "(I-D-CT)." I-D-CT? Now that's a new one. Just to start with the basics, Mel doesn't know what she is talking about. Why is it "correct" to label Lieberman as (I) but an eeevil trick to call him (I-D)? He describes himself as an "independent Democrat". The Democrats admit him to their caucuses. He voted for Harry Ried. What's more, that designation is hardly "a new one". 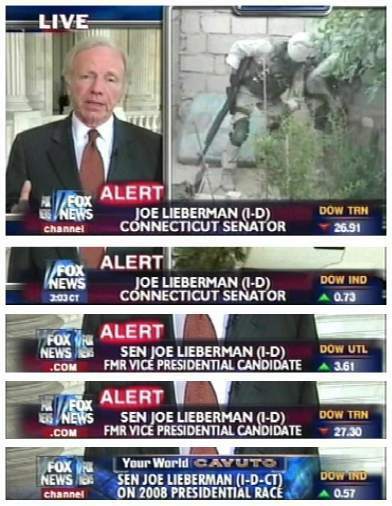 How does Mel think other cable channels label Lieberman? Like MSNBC and C-SPAN? Can anyone confirm if the above is true? And if so, what is the point of this topic? If you want to know if Dollars statement is true (which I doubt) why don't you go research it. Dollar, why don't you return to your pitiful little blog? Fox cut off his funding. When someone proves they made a mistake with factual proof. Am I suppose to take some radical Fox [expletive deleted] like Dollar's word for it? how about we just wait til she posts the video, then we'll all be happy. I know you and all the regulars here DO want the information to be correct. And still, there's Dollar with no proof. Just his not so factual words. We don't know if Melanie deliberately lied at first. But after her accuracy was challenged she made the farcical claim that you have to "get up close and squint" because otherwise it "looks like I-CT". We have Mel denying all requests to post video of the interview. Of course, we have her refusing to correct or retract the false information in her post, which still stands unchanged as we write this. As for her claim that she "reviewed the tape", she's used that line before--another occasion where instead of admitting an inaccuracy she piled lies on top of spin until the entire structure collapsed. We asked again and again for the newshounds to make a simple correction. They refused, stonewalled, and ultimately tried to lie their way out of a morass that should have been a straightforward admission of a mistake. In the entire Fox haters echo chamber, there is no source more inaccurate, irresponsible, and dishonest than newshounds.us. Thanks for posting this video Johnny, I was following this thread last night, although it was kind of hard to keep track of what was going on since your posts kept being deleted. Well, it's a pattern. She has pulled this exact same thing repeatedly, and each time she claims she checked the tape. Problem is, each time she insisted she had been right--and she wasn't. So either she's not telling the truth about checking the tape, or else she did check and simply decided to stonewall with a lie. Who can say? It's obvious, though, why she stubbornly refused to put up the video for all to see, isn't it? b) claim you doctored the footage. c) claim you're funded by fox and tell you to go back to your website that no one reads, without addressing the obvious lie. Oh well, good job anyway. The mutts are liars and happy to be such to further their agenda of far-left ideology and hate. They can't handle a single news source producing fair coverage of US and world events; their goal is a homogenized wacko-left media dominance and Fox challenges that goal. As Steven Colbert said: "Fox News is presenting both sides of the story -- the president's side, and the vice president's side." Oh wow, FF, you better give up. Jonathan has cited Steven Colbert. Case closed! But you'll note Jonathan said nothing about the clearly documented deceit and falsehoods in the latest hound embarrassment. Maybe there are some things that even Fox haters can't defend. johnny dollar: i'm only stating my opinion: claiming that Fox News is balanced is like claiming that the O'Reilly Factor is really "a no-spin zone". And we welcome your opinion. Unlike some sites, we don't run around deleting critical comments moments after they are made, or tell people they are not welcome. As long as the rules are followed everyone gets his say. But as you were giving your opinion, I was giving mine. And my opinion is that it is notable that you, who frequent the hound website a fair amount of time, do not defend their latest burst of deceit and falsehoods. That could be because you recognize it to be indefensible. Or perhaps you like being lied to and taken for a dupe by the mutts. I'm sure you have your reasons for not defending it here, and I suspect you won't confront them with the proof of their dishonesty either. Your choice. Jonathan's only 17, we should go easy on him. Jonathan, buddy, Colbert is not a credible source. I do respect your attempt at using sources, something the mutts seldom do themselves. While I enjoy watching the Colbert Report (truly funny show), I understand that it's a comedy show that bases itself on a news/opinion show and sells itself on being a sarcasm show. Come back when you have facts and not humor as a source. He's only 17? I thought from his writing he was older. That's a compliment, by the way, Jonathan. Don't compliment just yet J$, he still won't comment on the obvious falsehoods his crew disseminates. Jonathon is just as much a disingenuous hater as any of his mutt friends. old johnny boy PsD lives in the whacked out state of California. Comment: and proud of it! Still avoiding defending the mutts on their constant lies? Don't get sucked into insult sessions, bring us some facts regarding why they have to lie to smear the only cable news network that shows both sides of the story. If you're so concerned about the truth in media you should start cleaning up in your own backyard. J$, I know I risk getting smeared by you as a "pimp" again but here's the meat of my argument with video (which I obviously can't post here). The News Hounds screw-up you're all in a phony moral snit over is just a case of attacking the messenger to discredit the messenger. Nowhere I could see in your rant did you cover the main topic of Fox News mislabeling Lieberman as a "D." It seems your moral outrage over "inaccurate, irresponsible, and dishonest" reporting is limited to liberals. Should News Hounds correct their piece? Yep. Just as you should have corrected a video I criticized you about a while back. You didn't. Most bloggers don't correct stuff because it hoses up their air of infallibility. Well not only did the newshounds not correct their piece, they LIED to cover up their mistake. That doesn't bother you very much. I didn't go into the labeling as (D) because I agree that is incorrect. Of course they embellish it with all sorts of crap about it's a Fox trick to make him look...something. It's a little hard to pin down. The correct label is I-D, oh but wait, that's wrong too because, well, because Melanie says so. Never mind what the Senate records say. It's another Fox trick. This selective outrage about every little thing on Fox is so hypocritical and obviously phony. You can go on YouTube right now and see videos of Lieberman on various cable channels. Did you know just a few weeks ago CNN labeled him as a (D)? During a live appearance no less. I haven't heard all the outrage. When Fox mistakenly runs B-roll of Conyers, it's a huge deal, complee with demands for multiple apologies. Yet Olbermann shows the wrong picture of a black man and nobody cares. Earlier this week ABC showed a picture of Marion Berry instead of the pant-suit Judge. Where are the protests? Where are the demands for an apology? Has Schmoe Scasrborough run segments about whether ABC is racist? By the way, I routinely and always correct errors. I know of no video that had to be "corrected" but if there was something wrong with it I would have corrected it. Nobody cares about Olbermann screw-ups? Smells like baloney to me. You're an active poster at Olbermann Watch which constantly hammers the "Olberloons." You have plenty folks joining in that site's criticisms and juvenile name calling of the man. More to the point, I just did a YouTube search on Olbermann and got "about 18,200" hits. You think they're all by drooling fans? And if they are, maybe you need to ponder he is a god of punditry. Let me point out an obvious difference. Fox News is a network. Olbermann is a single show which is not representative of MSNBC's entire line-up that includes conservatives like Joe Scarlboro and Tucker Carlson. If the "where are the demands for an apology" from Olbermann include myself, you know I don't blog on MSNBC at EyesOnFox. You could say the same thing about a Tucker Carlson screw-up. Though, as you know (Olbermann Watch, I believe, quoted me), I have criticized Olbermann on my personal Overflow blog (http://sknabt.eyesonfox.org/?p=62). The correction revolves around this video where you conveniently edit out Mort's pro-Bush spiel: http://johnnydollar.us/2004a/C1049953760/E20060904144646/index.html. Since your comments aren't searchable by users, I can't begin to reconstruct the argument. I only found your blog entry by searching my blog, getting a date, then digging day-by-day through your archive. What a waste of time! We beat the Fox News mistakes to death in the comments here: http://www.eyesonfox.org/?p=199. So I won't regurgitate the argument. Oh THAT again? Let me try to make this clear. You said Mort didn't say "X". I posted a clip that proved Mort DID say "X". I didn't include Y or Z because the clip was a demonstrative one. Its purpose was not to summarize everything Mort said, but to prove one point: he DID say "X". When I post a clip in the media category, I make sure that it accurately reflects the overall thrust of the conversation. When I post a clip in the slanders category, it is for one purpose only: to prove that something was or was not said. Mort could have nattered on about Bush for another ten minutes but that was irrelevant to the purpose of the clip, which was to show that Mort did in fact say "X", NOT to document everything ELSE he may have said. Clear now"?